Today’s post is solely an infographic from the web–but it is a powerful infographic that bears a great deal of attention. Above are the current nations of the Earth represented by population rather than landmass. This population cartogram was created by Max Roser to make people think more clearly about the real nature of the world’s human population. Each little block represents half a million people. Countries which loom large in world attention effectively vanish (like Russia, where mismanagement and grief are causing the population to shrink) yet countries which don’t appear in the shrill daily newscasts–places like Nigeria, Bangladesh, and Indonesia–are revealed as titans. You can find the original in this article (which is fortunate, since WordPress will undoubtedly make reading the version above effectively impossible), along with a number of additional fascinating graphics. We will talk more about the meaning of some of this later on, but for now it is worth just scrutinizing the cartogram and marveling at a world where Madagascar is bigger than Australia. Well, the American election is coming up tomorrow. I have tried not to write too much about this great national contest, since every other media channel in the world has covered it non-stop for 20 months now, but I guess it is time for Ferrebeekeeper to hop down into this mudpit and support a candidate. In the past, when there has not been such difference between candidates, I have supported voting out incumbents or cross-voting (i.e. voting blue in red states or red in blue states). Alas, Americans neglected my fine advice and we are now experiencing some real national strife, so for the 2016 election I am advocating a different course to unite the troubled nation. Hilary Clinton should be our president. If you are a voting-age United States citizen you should vote Democratic up and down the ticket. Now, admittedly Hilary is 1) grasping, 2) secretive, and 3)shifty , but she exhibits these traits well within the ordinary operating tolerances of American politicians. Indeed, in the right light, and, with a bit of squinting, these traits could be 1) ambition, without which, no one would be a politician to begin with, 2) the ability to plan, and, 3) the ability to compromise and change tack based on the circumstances. Additionally, she personally knows every important leader in the world. Above all, she is a workaholic, a smart person, and somebody who cares that the nation succeeds and prospers. So there are some very legitimate reasons to hope that Clinton will be our own iron lady (provided she can jettison this stupid rubbish about how free trade and globalism are bad for us). Hopefully she can also project American power a bit more robustly than certain presidents in order to gladden our allies and dismay our enemies. She certainly has vast experience of public life, a sharp mind, and an indomitable will. So I am not merely voting for Hilary because of the despicable nature of her opponent. Speaking of whom: beyond Donald Trump’s lack of policy, his ignorance of world affairs, and his extremely shady business practices, there is one overriding reason Trump should never be president: he is mean. He takes personal delight in cruelty, violence, and spite, in a way which I have not seen in another American politician (or even in any other person except for a few outliers in Junior High School whom I suspect have long since been hanged). Because of his sadistic streak, I have been sad to see Trump win over so many voters. New Yorkers know that he is a con man, a loser, and a violent lout, why can’t everyone see these things about him? I kind of suspect it is more about primatology and less about people sharing Trump’s atrocious values–I certainly hope so. But enough. Too much has been said about Trump. The whole world has paid attention to him for far too long. However I would like to talk about Trump supporters before the election ends tomorrow and we pretend we never have to think about this again. The followers fall into two different categories: established Republican political leaders (who have always pretended to be lukewarm, although I don’t think that is really the case), and grass-roots political supporters who tend to be rural working-class whites. Appallingly, the Republican establishment has supported Trump even though anyone who has lead people in any capacity can plainly see he is not a worthy leader. This is why I recommend you vote against all the Republicans tomorrow. A lot of writers and talking heads have acted like they are sorry for Paul Ryan, or Ted Cruz, or other Republicans who have been forced to support Trump. This is ridiculous. Those people haven’t been forced to do any of the things they have done. They have chosen their actions for specific reasons, and they should be judged accordingly. The current Republican leaders have been throttling the government of resources so that it doesn’t work right and then acting as though this somehow the fault of government. They have been throttling people of resources so they don’t work right and acting as though it is the fault of people. They are behind Trump not out of fear (although they do strike me as singularly cowardly) but out of lust. If Trump wins they will be able to use his inattentive narcissism to remake the country in a grasping and mean-spirited way of their choosing. Which brings us to Trump’s grassroots support. I am a West Virginian. The whole nation makes fun of the state and this is generally regarded as fair sport (since, among the chattering class, it is not uncouth to make fun of poor white people the way it is regarded as bad form to make fun of poor brown ones). Additionally, the benefits of globalization have not much “trickled down” into West Virginia, except perhaps in the form of fracking revenues. To my horror, West Virginians are taking their revenge by voting for Trump. It is like the capuchin throwing away the cucumber. It will not help them. Indeed, this time, such spiteful protest could actively hurt us all. East Flatbush, the Afro-Caribbean immigrant neighborhood where I live now reminds me greatly of Clay County—in bad ways and good ones. Poverty, addiction and and feuding are big problems, but the great bravery, loyalty, and personal generosity of the inhabitants tends to keep everyone moving forward and make life worthwhile. The distinction between city and country is a false one. The distinction between Americans of different races, religions, and genders is likewise not so big as some people would make it out to be. Democrats for all of their flaws, believe in a united nation. Lately Republicans are deliberately dividing us so they can get everything they and they alone want. The Democrats are wrong-headed and frustrating. They tend to neglect the two most important issues in front of us, research and national defense. But Republicans have stopped caring about these issues as well and they are actively trying to injure the nation so that they can advance their own agenda. This political infighting is causing people to lose faith in the system (which feeds into the “government is broken” death cycle which is so dangerous). The United States needs to be careful. The Han Dynasty and the Soviet Union stopped thinking they were countries and suddenly they were not. We are the United States of America, but it could be otherwise. Anyone who wants to be president should recognize that the nation needs both the sharp-eyed riflemen from West Virginia and the shrewd-minded accountants from Montclair–and all sorts of people from everywhere else (Hillary Clinton, an Appalachian who ended up in New York, knows this) . The states and their people are deeply heterogeneous but stand beside each other through any crisis–structural, cyclical, or natural. We are not the “Fiscally Independent and Selfishly Aloof States of America”. Our name is much finer than that. Let us remember that on election day…and all of the other days after that. We must work hard with President Clinton so that the election of 2020 is not so divisive and awful. I was going to show you the new blossom monsters I made to celebrate the annual blooming of the cherry tree in my back garden in Brooklyn, however, when I looked at the date on the calendar, I realized that today (April 25th) is World Penguin Day! Considering the threats faced by our black and white friends down under, I am going to keep the monsters in the hopper for tomorrow and dedicate today’s post to penguins. Now I could write about actual penguins (for their lives are intense and interesting) or I could write about literary penguins, or about penguins in zoos. Yet, it seems to me that some of the most instantly recognizable penguins are mascots and corporate logos. I don’t need to write a natural history treatise on penguins or call your attention to Anatole France in order to make you love penguins. If you are a good-hearted person, you already love them (if you are a hard-hearted monster who hates our flightless friends, what are you doing here? You need to stop reading and reexamine your life from bottom to top). So here is a gallery of penguin logos and mascots for you to enjoy.Linux and Penguin Books are among the more noble corporate entities out there, but there all sorts of other mascot penguins of all sorts. I have hundreds of penguin classic books! I love this logo! But what about the classic cover design? There are more penguin mascots than you could ever imagine. I have spared you from the thousands upon thousands of designs, costumes, and logos I have found and just put up a few of the highlights. One thing the World Penguin Day mascot hunt has taught me is that people like penguins more than we even know. We need to work harder to protect our elegant little feathered friends. If they start going to be extinct we are going to be shockingly sad. 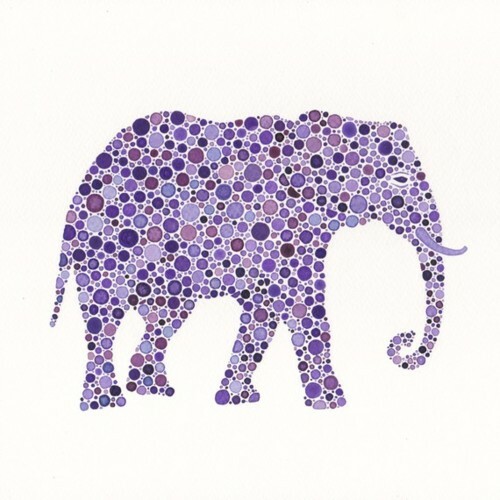 It is World Elephant Day! 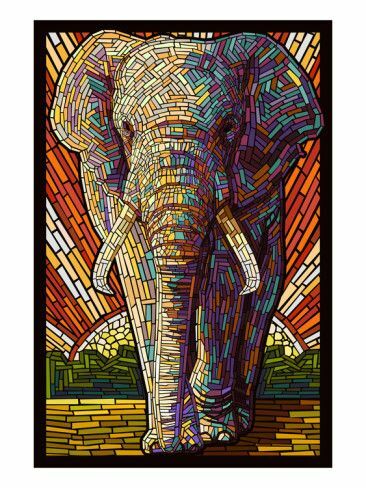 August 12th is set aside for the contemplation of the greatest land mammal (and maybe the greatest animal overall) the wise, compassionate, beautiful, imperiled elephant. 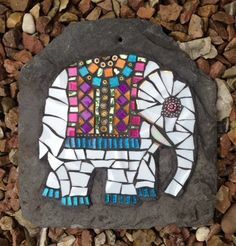 Elephants are my favorite animals! I truly love them so much (admittedly at a distance)…yet I only just got home and I have to get to bed so I cannot write the story I want to tell—of heroic Yao Ming trying to save the world’s elephants. 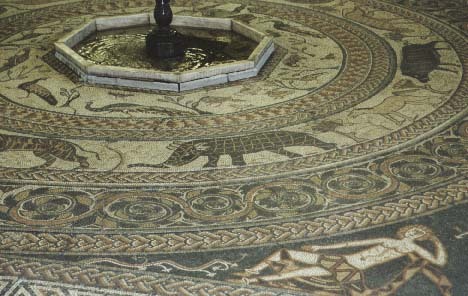 Instead I am going to save that story for a day when I have more time and just do a gallery post of elephant mosaics. 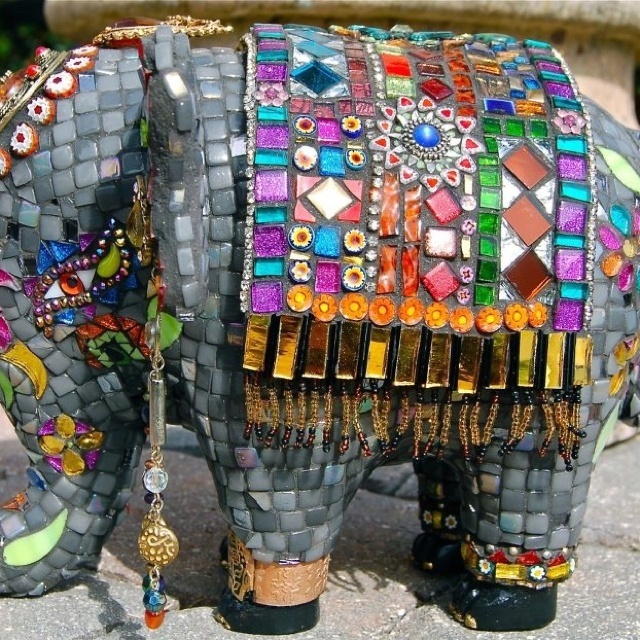 Mosaic Flower Elephant by Diana Jane Designs. 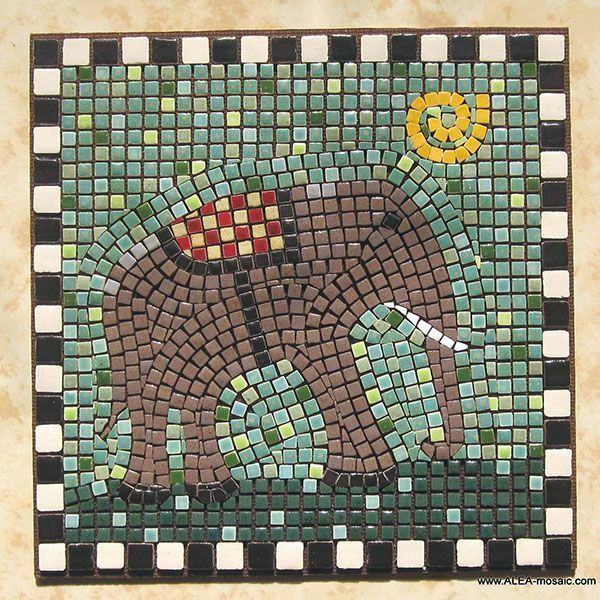 Some of these tile artworks of the noble beasts are pretty good, but none of the works really do the great proboscideans full justice. Clearly there are going to have to be more elephant posts before next August! In the meantime, keep talking about elephants and campaigning for them among your friends and peers. A world without elephants would not be a worthwhile place. They are a critical piece of the great mosaic of life! 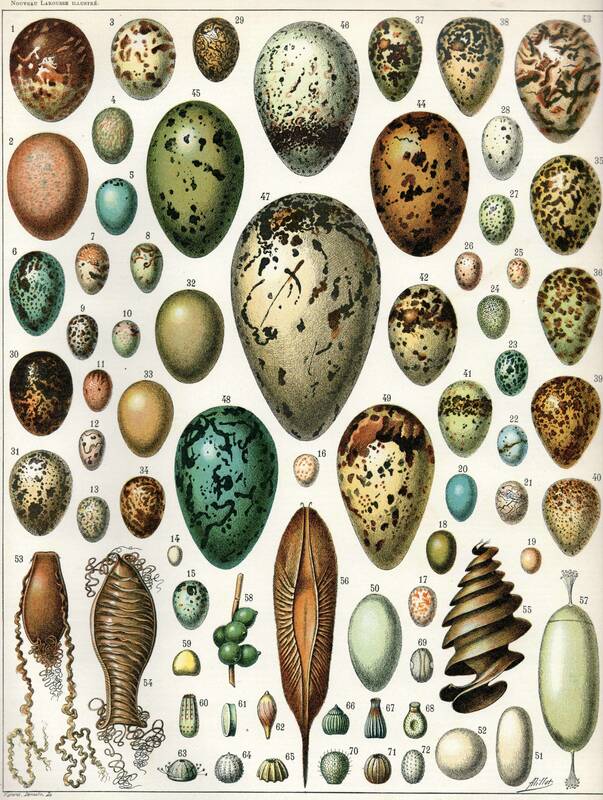 This website has been unflagging in its dedicated to oviparous creatures. Catfish, turkeys, the vast majority of snakes, all fowl, and even the amazing platypus and echidna are creatures which reproduce by means of eggs. They are all well worth celebrating! Hooray! Yet somehow, I feel like the World Egg Day High Council (an arm of the even greater International Egg Commission) cares little about ovuliparity (external reproduction via egg). Instead they are concerned only with devouring eggs. They are in fact ovivores of the highest degree—to such an extent that they have built an international organization to promote the continuous eating of eggs to the exclusion of all else. We live in a strange world. 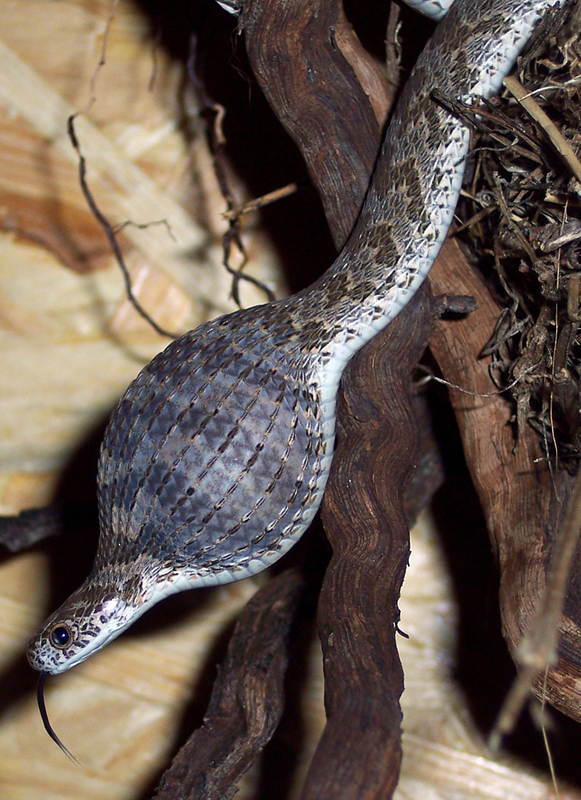 There are 11 species of snake within the Dasypeltis genus and all have evolved to feed exclusively on eggs. These non-venomous snakes live throughout Africa, but prefer wooded areas with large numbers of birds. The snakes possess acute senses which allow them to determine whether an unbroken egg is rotten or too developed for them to eat. 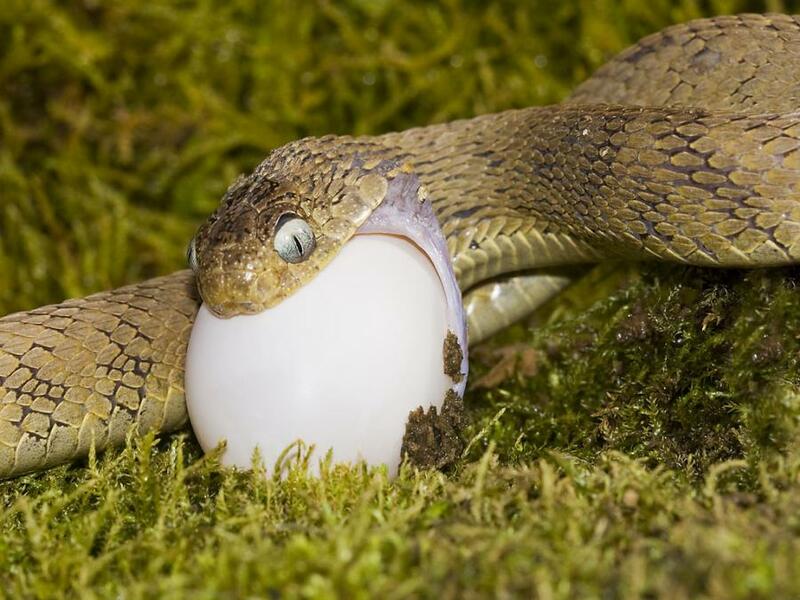 Not only are the snakes gifted at hiding and climbing trees, they also have specialized anatomical features for egg consumption including supremely flexible jaws, supple necks, expandable balloon-like throats, and internal vertebral knobs for bursting the egg once consumed. 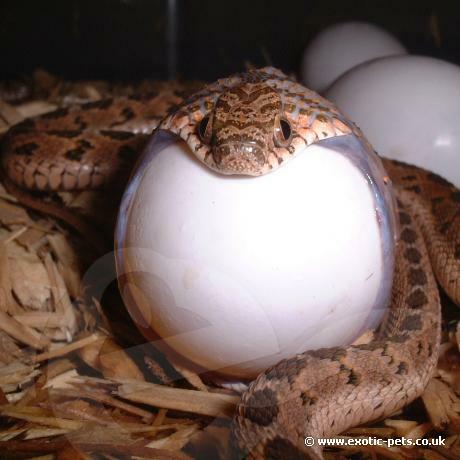 The snakes regularly consume eggs much larger than their own heads. After eating breakfast, the poor creature looks like a maraca! Once the unbroken egg is swallowed whole, the snake’s internal organs burst it open and leech all nutrients out of it. The indigestible shell is regurgitated. Virtually no nutrients are wasted. Finally, and best of all, Dasypeltis fasciata not only lives entirely on eggs: the snake also reproduces by egg! It is an Oviparous ovivore. Females lay one or two clutches of 6-25 eggs each. 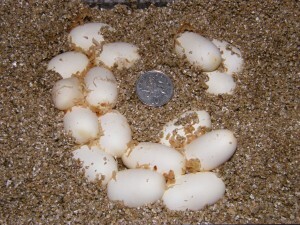 The little eggs measure 36 mm x 18 mm (1.4 x 0.7 inches) and are sometimes eaten by rodents or lizards. You could write to the International Egg Council and explain why this snake would be the perfect mascot to help them popularize eggs. Undoubtedly the exalted high egg commissioners would quickly acknowledge that there can be no purer avatar of the incredible edible egg than this lovable snake. 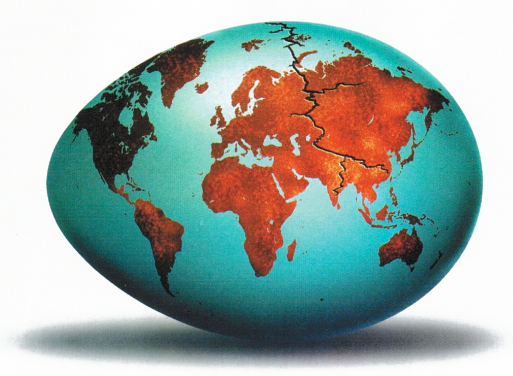 Happy World Egg Day! 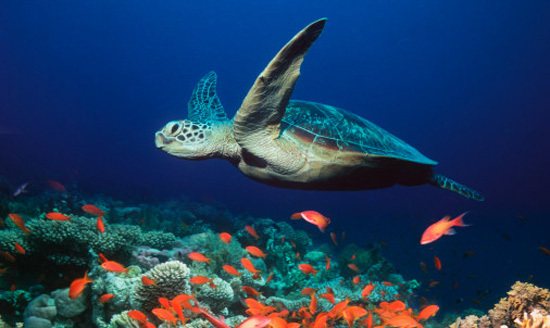 Today is World Turtle Day when we celebrate all things chelonian. “That is wonderful, but what does it have to do with the fabulous Hindu tableau above?” you are probably asking. 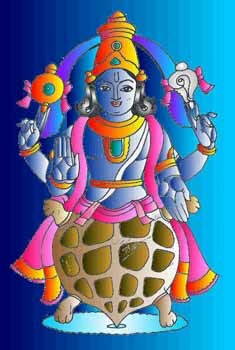 Well, the second avatar of Lord Vishnu, the preserver of all life, (who appears again and again in the world as different incarnations) was the turtle deity Kurma. The story is told above, but here is a streamlined narration to go with the painting. 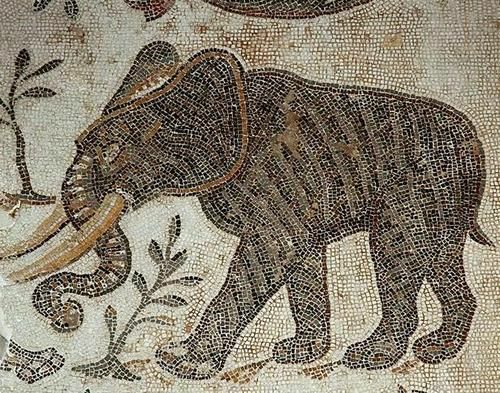 The story begins with an elephant mishap: the great sage Durvasa presented a magnificent garland to Indra, king of the gods, who in turn presented the wreath to his magnificent war elephant. 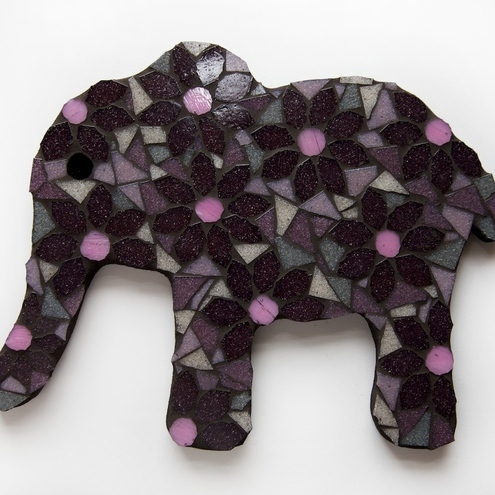 Unfortunately the elephant had limited aesthetic appreciation of the gift and trampled it. Deeply offended, Durvasa cursed the gods to lose their strength, radiance, and immortality. Thus cast down, the gods desperately looked for a solution from Vishnu, who advised them to quaff the nectar of immortality. Sadly there was no nectar available and the only way to produce more was to churn the ocean of milk with such force that the sacred milk clarified into the elixir. To complete the task, the gods allied themselves with the demon Asuras (power-hungry beings of near divinity who frequently fought the gods). 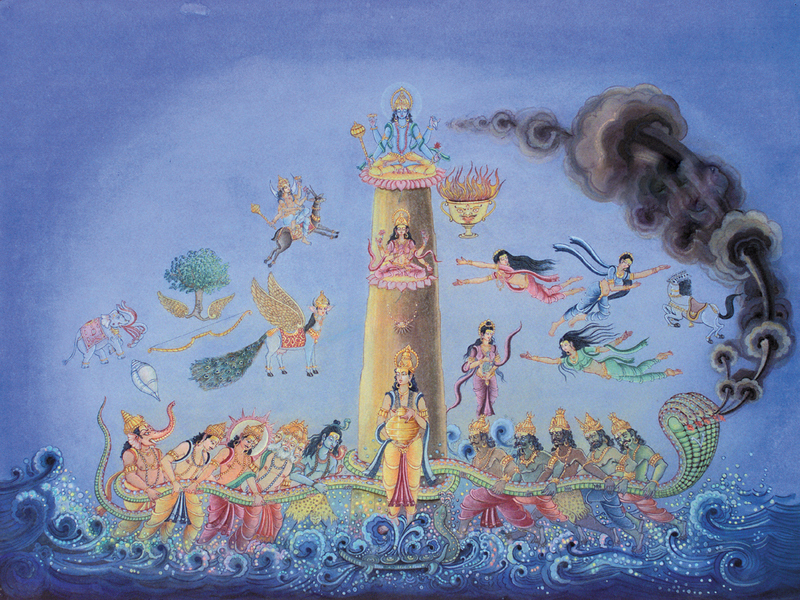 The gods took the pillar-like Mount Mandara as a great butter churn and, with help from Vasuki, the king of all snakes, they began to churn the ocean of milk. So great was the force of gods and Asuras combined that Mount Mandara begin to sink into the ocean. 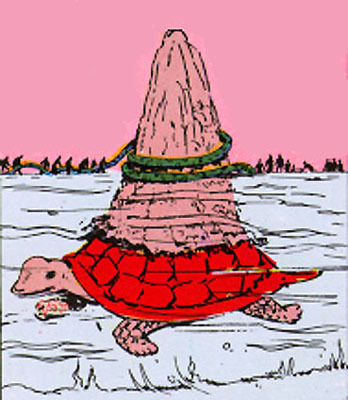 Vishnu then transformed himself into the vast turtle Kurma and swam beneath the Mountain. His flippers churned the froth. The gods, demons, and great snake all exerted themselves to their utmost, and the turbulent ocean of milk became refined. Fourteen precious treasures arose from the sea, culminating in the sacred nectar of immortality. The picture at the top (which you should enlarge!) shows the gods on the left and the Asuras on the right. The king of nagas is acting as a drill rope wrapped around Mount Mandara. 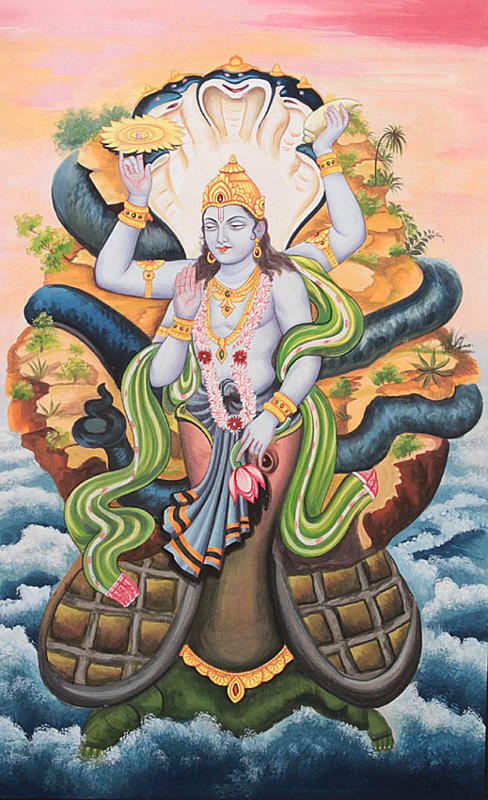 Vishnu sits atop the mountain and does not seem especially turtle-like. Fortunately I have included some paintings and drawings of him as a great turtle. Anyway Happy World Turtle Day! 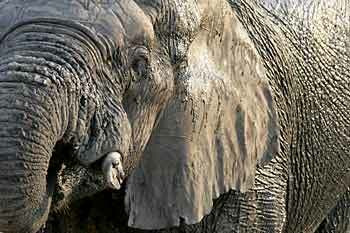 Today is World Elephant Day—a one-year old holiday dedicated to the preservation of the world’s two remaining species of proboscideans (a great and ancient order of mammals which over tens of millions of years has included 161 different species that we know of including elephants, mammoths, mastodons, stegodons, deinotheres, moeritheriums, and all sorts of other amazing animals–which we will talk about later). 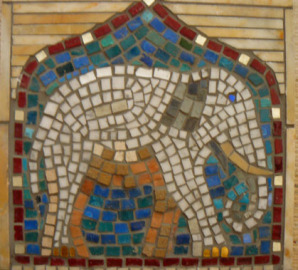 To mark this day and do my part for elephants (which are quickly vanishing from Earth due to insatiable Chinese lust for ivory) , I have spent hours and hours writing the beginnings of various essays about elephant cognition, their importance as a keystone species wherever they live, and their history and attributes. I have abandoned each of these essays because they have lacked visceral power which I want to bring to the subject of my favorite animal. Instead of providing a laundry list of astonishing things which elephants share with humankind (things like altruism, awareness of death, grieving, knowledge of medicine, tool-use, comprehension of music and the arts, and the ability to mine salt and clay) I have decided to instead present an anecdote about actual elephants which I have taken from Cynthia Moss, a researcher who has spent her life observing elephants and researching their family structure. Since 1973, Moss has watched the family of one matriarch, Echo, an elephant living in Kenya. 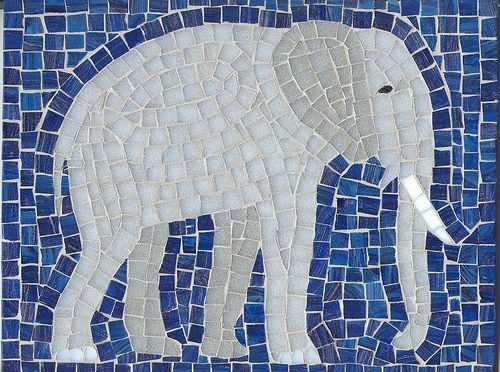 The story of Echo’s extended family reads like Russian literature in complexity and richness (although the reading is much sadder since elephants seem to be living through the agonizing death of all their kind). Elephants live human-length lives and have intricate social bonds in their own herds and with the herds they encounter. They bond deeply with their families over the decades they share together and they help each other out even at the risk of death or terrible injury. [Tina’s] knees started to buckle and she began to go down, but Teresia got on one side of her and Trista on the other and they both leaned in and held her up. Soon, however, she had no strength and she slipped beneath them and fell onto her side. More blood gushed from her mouth and with a shudder she died. 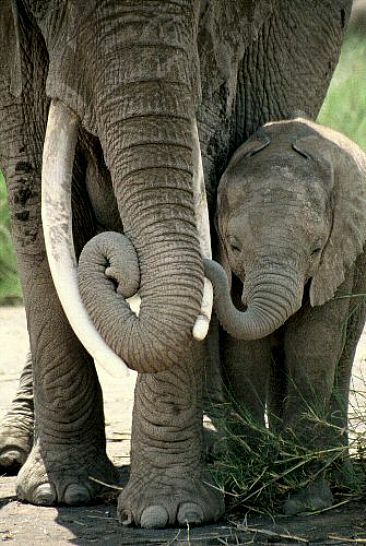 Elephant use their tusks for everything (and tusks certainly do not grow back). Just as most people tend to favor one arm, elephants favor one tusk over the other–usually the right. Moss goes on to describe how Teresia and Tina’s sisters spent the night with Tina’s body, tenderly covering their fallen family member with sticks and dirt. 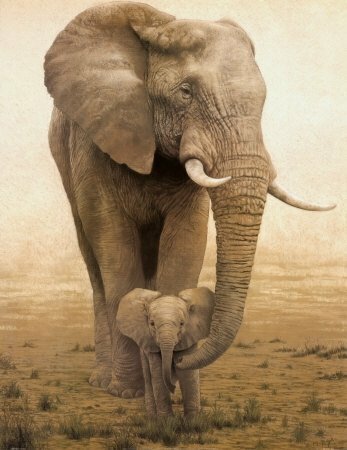 In the morning the other elephants reluctantly left, but Teresia was unwilling to depart and kept gently touching her daughter’s body with her foot. 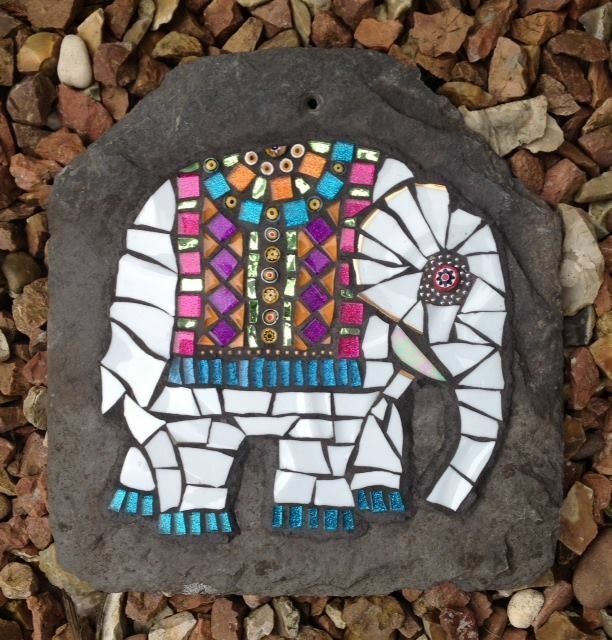 Only when the other elephants repeatedly rumbled to her did she finally move on. You can find the entirety of Moss’ book online here, but be warned, it is tremendously sad—like an elephant version of “The Road” except with more likeable characters. During the Permian era (around 300 million years ago) the strange slow dance of Earth’s tectonic plates brought together all the world’s major landmasses into the supercontinent Pangaea. Because of its very nature, Pangaea changed the world’s climate in bizarre ways. Baking hot deserts were so far from the coast that they never received rain. Landlocked seas boiled away and left great evaporitic deposits of strange minerals which we still mine and exploit. Huge mountains rose and fell as the continents crashed together. Pangaea lasted for approximately 100 million years, during a time of tremendous biological upheaval and diversification. The worst mass extinction in the history of life took place during the continent’s heyday (The Permian-Triassic extinction event took place about 250 million years ago). After the great dying, he first dinosaurs and mammals walked the super continent. However this post is not a meditation concerning Pangaea (thankfully– since its history is extraordinarily complicated). The idea which excites me is that Pangaea was only a third of the Earth. The remainder of the globe was taken up by water. 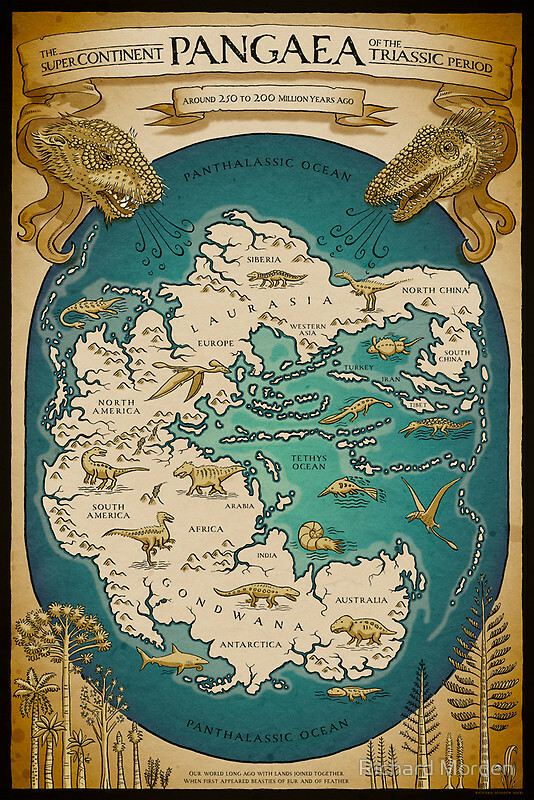 Between Laurasia and Gondwana there was a great wedge shaped ocean called the Tethys Ocean (indeed Pangaea looked somewhat like Pacman—as you can see on the beautifully illustrated map by Australian freelance illustrator Richard Morden). Named after a titaness who was the daughter of Uranus and Gaia, the Tethys radically changed shape as the continents separated. Through big parts of its history, large parts of the Tethys consisted of warm shallow continental shelves (which are ideal environments for fossil deposits). Paleontologists and Geologists thus know a great deal about the natural history of the Tethys Ocean. 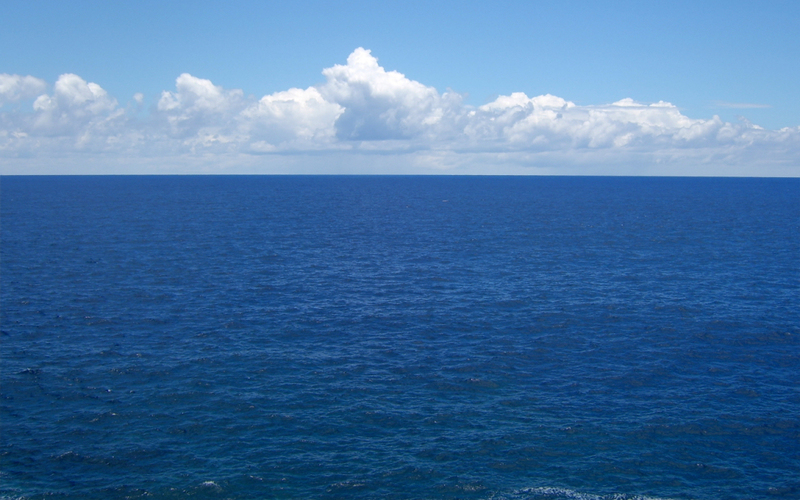 The remainder of the globe was a single world ocean called Panthalassa (or the Panthalassic Ocean). If you looked at Earth from outer space from a particular angle it would have been entirely blue (which is fitting for “Panthalassa” was not named after any god or goddess but from a Greek neologism meaning “universal sea”). The Panthalassa is not so well known as the Tethys. As Pangaea broke apart almost the entire ocean floor was subducted underneath the North American and Eurasian plates. However Geologists sometimes find tiny distorted remnants which were one part of the gigantic world sea. 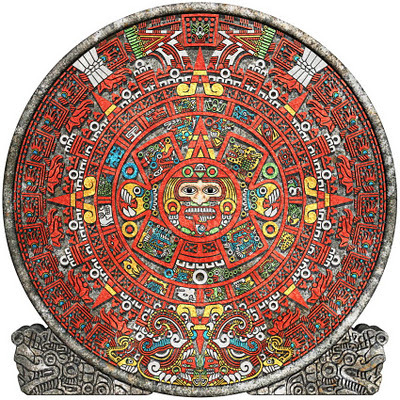 According to wild-eyed (& hare-brained) eschatologists the world is supposed to end tomorrow (December 21st, 2012) as the Mesoamerican long-count calendar runs out. 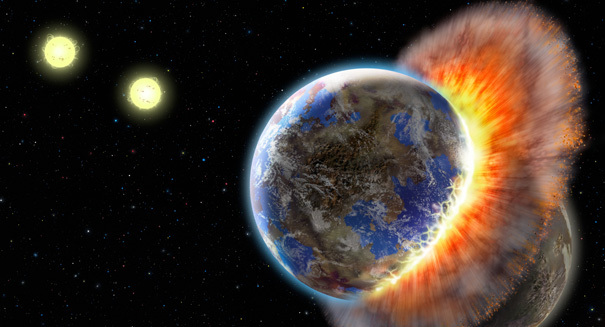 The methodology of destruction is a bit unclear, but a general consensus (of stupid crackpots) seems to hold that the nonexistent mystery planet Nibiru will slam into the Earth and everything will disintegrate in fire. Volcanoes and solar storms are also somehow featured in some versions of the narrative. All of this sounds very exciting—and it would certainly prove immensely fascinating to astronomers who keep a close watch on the local solar system with telescopes and spacecraft–and have never seen any hint of the apocalyptic space phenomena made up by crazy people. Yet I think we are overlooking a big part of the fun. 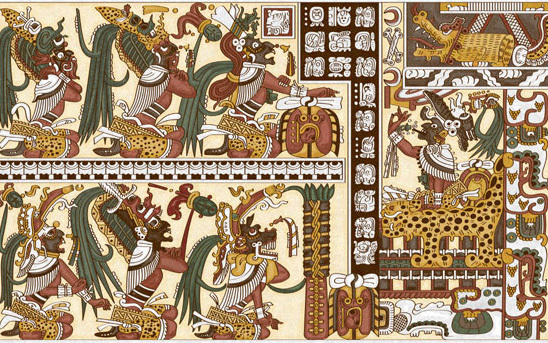 The long count calendar is a 5,125-year reckoning of time created by the ancient Mayans. 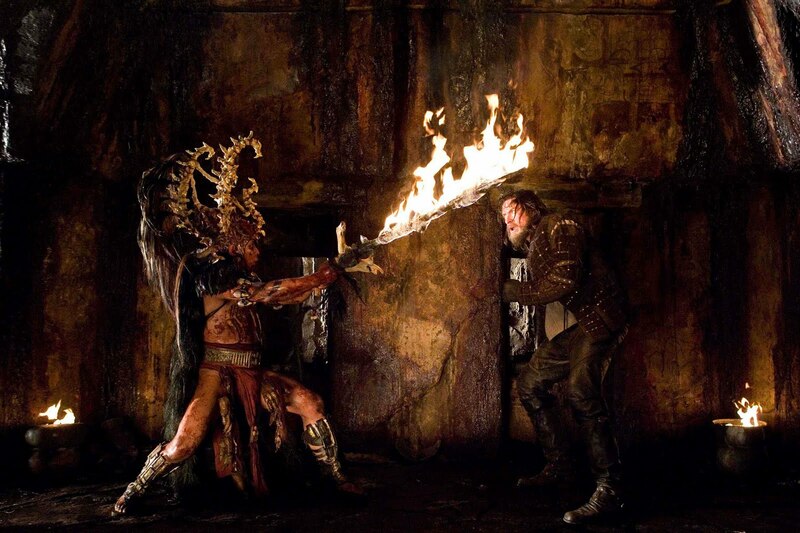 Since tomorrow’s apocalypse is therefore Mayan, one would certainly expect the lords of Xibalba (the Mayan gods of the underworld) to show up to harrow the Earth–or, you know, at least to assist Nibiru in finishing off the job. 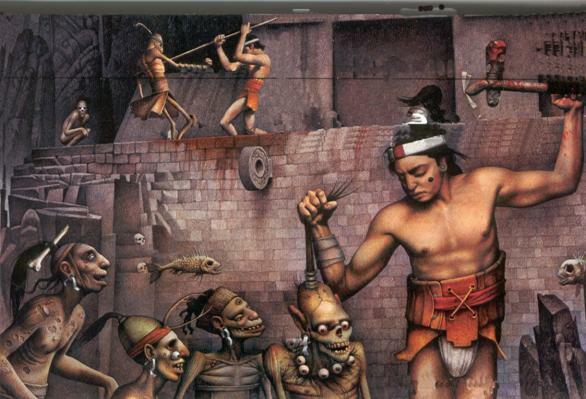 Dedicated readers will recall that we have already met the gods of Xibalba in this dramatic post concerning the great heroic quest at the center of Mayan mythology. To summarize, the sun and the moon went down into the dark torture city of Xibalba to free their father’s spirit and release the living world from slavery to the gods below. After an epic magical battle, the story ended Hollywood-style with the twins burning and hacking all of the underworld gods to pieces. The heroes then apotheosizing into the familiar celestial bodies we know and love. Ahalmez (Sweepings Demon) and Ahaltocob (Stabbing Demon): are gods for the obsessively cleanly. They hide in dirty or unswept areas of peoples’ houses and, when the filth is too much, leap out to kill the slovenly inhabitants. Chamiabac (Bone Staff) and Chamiaholom (Skull Staff), are bone demons who turn dead bodies into skeletons. Xic (Wing) and Patan (Packstrap), are gods of pneumonia and lung disorder who cause travelers to choke to death from pneuma disorders. Most importantly One Death and Seven Death were the two rulers of the underworld. They were synonymous with death itself (although I have no idea what their jersey numbers stand for). Hmm, all right, that is a pretty scary list and these guys certainly sound like bad news (although none of them seem to be particularly affiliated with planetary collision). I guess we will keep our eyes peeled for stabby glowing characters in loincloths jumping out from behind the refrigerator. That seems like a pretty direct slap in the face to the lords of Xibalba (assuming any of them survived the rampage of Hunahpu and Xbalanque). I guess we’ll watch the heavens tomorrow with interest. If anyone is incredibly scared, you can come over to my place for chocolate pie, hot peppers, and tequila.